Varutra, headquartered in (Pune) India, is a pure play Information Security Consulting; Research and Training services firm, providing specialized security services for software, mobile and network. Varutra is a CERT-In empanelled qualified IT Security Auditor organization having clientele from India and overseas. We are motivated to provide our customers with specially tailored services providing protection against internal as well as external threats and reduce business risk to improve security posture, achieve regulatory compliance and increase efficiency. Our team comprises young, enthusiastic brilliant minds with experienced consultants contributing to the research and development at Varutra. Our goal is to provide security in totality, which ensures that every possible facet of an information threat is covered during our engagement. We constantly strive to outdo ourselves for the best possible solution. 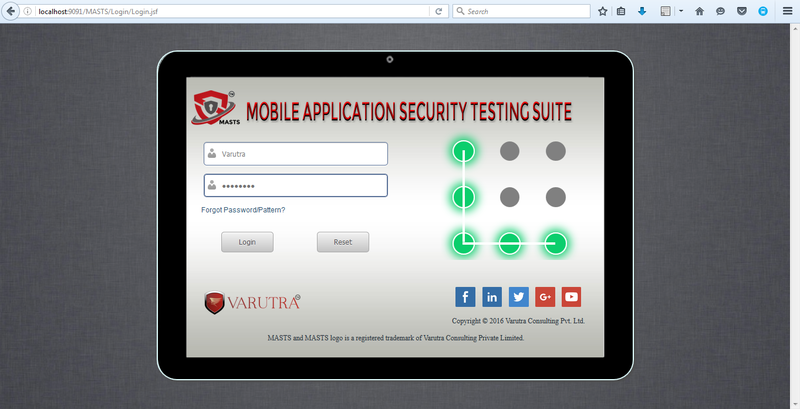 MASTS (Mobile Application Security Testing Suite) is a patents filed product developed at Varutra from it’s extensive research and experience gain into Mobility and Applications Security. The idea of MASTS was engineered with an aim to create an easy to use and intelligent automated solution, which simulates manual security testing as closely as possible. It reduces manual efforts, false positives and ensures effective testing results with minimal timelines. MASTS allows to test the target mobile application with real world testing approaches such as Black Box, Gray Box. 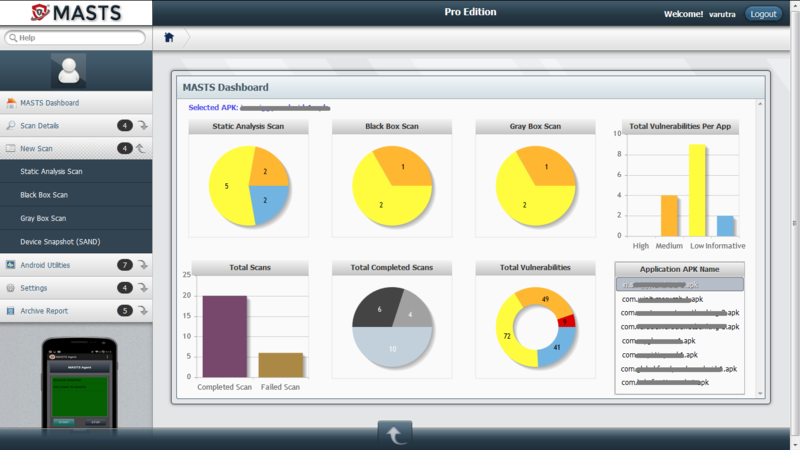 MASTS is capable of identifying vulnerabilities by performing Static and Dynamic analysis of mobile applications. It conducts testing of applications by applying its test cases derived from OWASP Top 10 for mobile as well as custom test cases, which cannot be detected by a normal scanner. 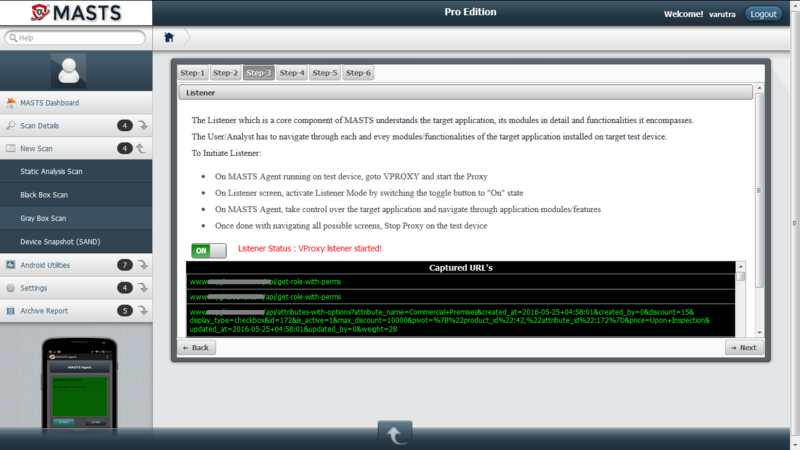 MASTS facilitates the mobile application security testing by providing various other utilities a pentester can use during the testing/audit. MASTS supports application platforms such as Native Mobile Application, Application-using SOAP/REST based Web Services, Mobile Browser Based as well as Hybrid Applications. The Indian Computer Emergency Response Team (CERT-In) is a Government body which is operated under Ministry of Communications and Information Technology, Government of India. It is a nodal agency which is responsible to deal with cyber security incidents comprising to National Security, Hacking, and Phishing attempts for the nation. It acts as a backbone which strengthens IT security defence of the Indian Internet domain via reporting incidents, promoting best practices and creating awareness throughout the nation. Being a CERT-In empanelment company is an acknowledgement of our technical expertise and skilled resources in conducting Information Security Assessments. Varutra conducts internal & external vulnerability assessments, external penetration testing on servers (web, application and database) and networking devices to identify possible vulnerabilities (configuration weaknesses) in the IT infrastructure. As an empanelment auditor we are qualified to conduct audits for vulnerability assessment, penetration testing and network security audits of various Government organizations and other sectors too. These audits allow our clients to be proactive in identifying and overcoming vulnerabilities in their IT infrastructure. Audits also provide better IT security controls to be in place and compliance, ensuring proper IT security strategy without affecting business requirements and objectives. We feel proud to announce that Varutra has achieved the Indian Computer Emergency Response Team? (CERT-In) empanelment as an IT Security Auditor. The empanelment is yet another milestone in our journey to build a global company following certain said standards of CERT-In, after passing through a number of challenges in the selection process. This will help us in securing our clients and certify them. Target mobile application will be tested for static code (APK level) security issues. User need not to authenticate with the target mobile application for scanning. Logcat captures device logs of the target mobile device and allows pentester to download it in plain text on local machine for further analysis. Exporting reports of the scan results, including completed scans and failed scans. 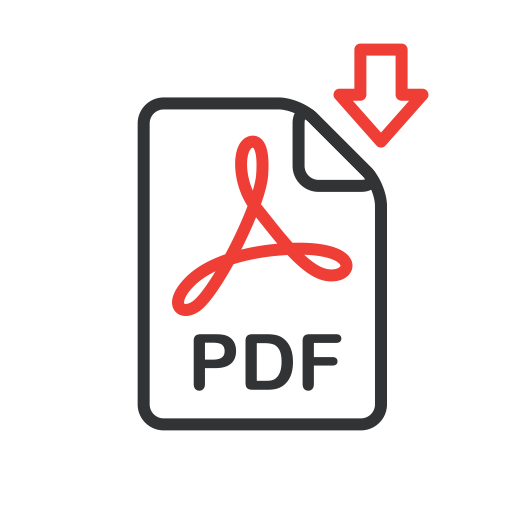 Reports can be exported in PDF and HTML formats. Target mobile application will be tested for vulnerabilities without logging into the application. 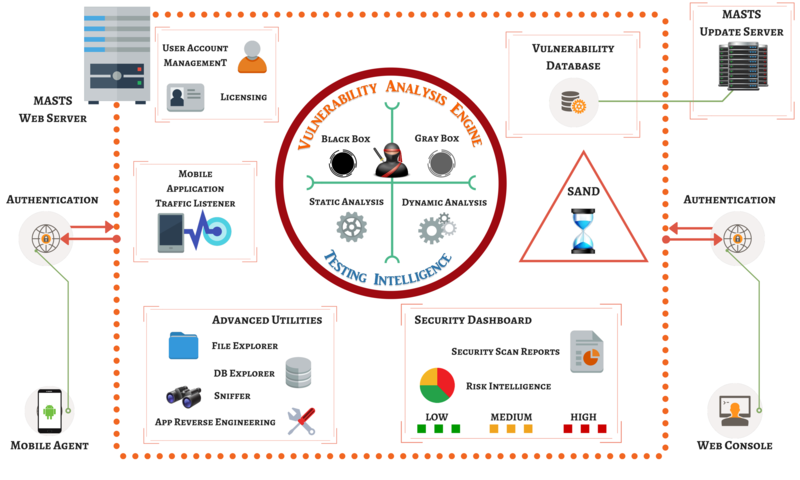 SAND utility provides taking a Snapshot of the target device, provide details such as number of application installed, permissions on those application, files and databases created by the application, etc. SAND Comparator provides the facility to compare any two Snapshots of the target devices to display details on any modifications done before and after installing the application or before and after login into the application, etc. Target mobile application will be tested for vulnerabilities by autheticating into the application. User must enter the valid credentials before MASTS conducts the testing. A TCP Sniffer acts like a proxy on the connection/communication in the network. TCP Sniffer captures the TCP traffic going from the target mobile application and coming from the server and analyze it. 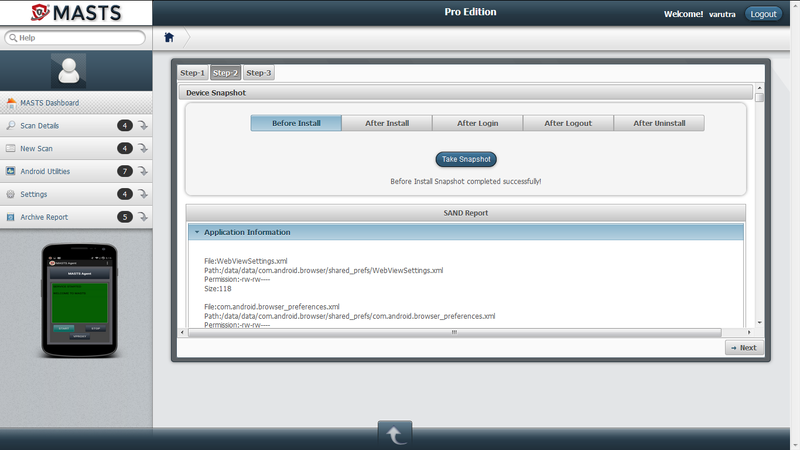 It extracts the source code of the application APK and analyze it for any known security issues under static testing. Also facilitates pentester in verifying reverse engineered code to check for possible modification and tampering. 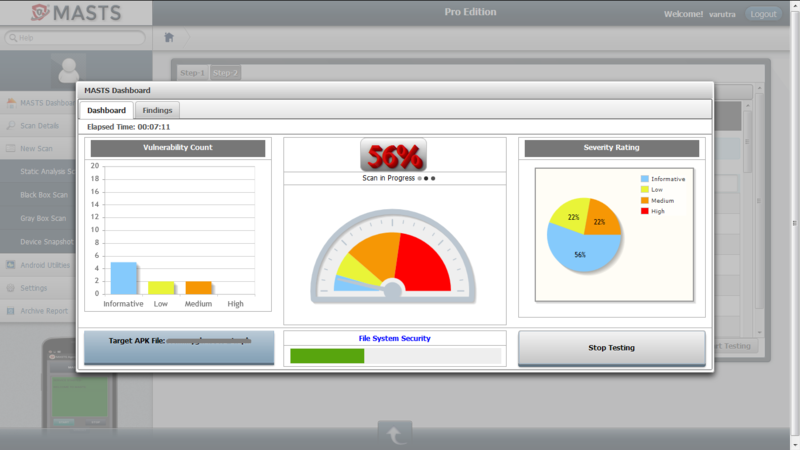 After successful login MASTS dashboard/home screen is displayed. 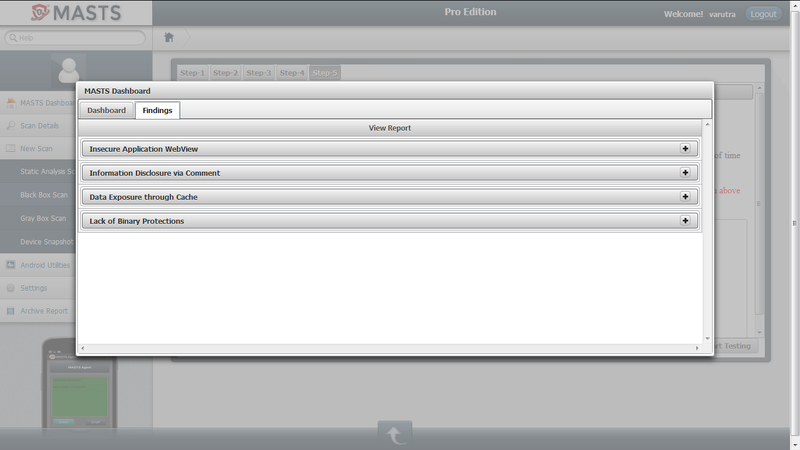 Tester can navigate to selected Scan module he/she wants to conduct, SAND and other utilities, view Reports, etc. Two options are provided to the tester to conduct static code (APK) level testing. Option 1: APK File Upload Option 2: APK File Chooser Tester can select any option according to the need by selecting the target application APK and can proceed ahead. Enter the scan name to set it for the current static analysis scan. Any desired scan name is allowed to be entered. Along with it, the tester has to select one option prior starting the scan, here we have selected APK File Upload. Browse and select the target Android application APK file in this step from local workstation on which static analysis testing is to be performed. The tester will be notified once the target application APK is uploaded successfully. Select the target Android application APK file in this step on which static analysis testing is to be performed. The tester will be notified once the target application APK is downloaded successfully. Once the scanning is started, the tester will be able to see MASTS Dashboard which shows current scan status, vulnerabilities found, their count and their severity rating respectively. 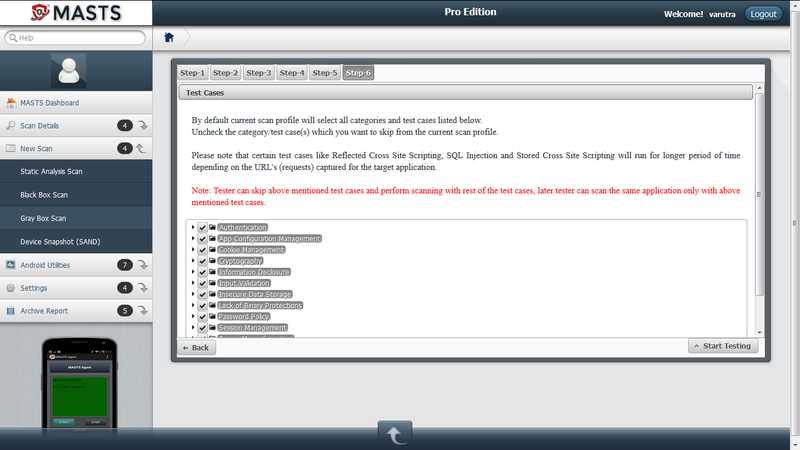 Upon completion of the current static analysis scan, the tester will be able to see the report of the findings based on current scan profile. Enter the scan name to set it for the current black box scan. Any desired scan name is allowed to be entered. Select the target Android application APK file in this step on which black box testing is to be performed. The tester will be notified once the target application APK is downloaded successfully. Tester must start VProxy on the target test device and also turn On the listener on MASTS dashboard screen so that the traffic will be captured (for dynamic testing). Traffic and captured URL's in previous step, will be listed in this step. Tester can check/un-check the desired URL's to include/exclude from current black box scan. Irrespective of any traffic/URL's captured, tester can check/uncheck the test cases which will be applied on the URL's (captured traffic). Upon completion of the current black box scan, the tester will be able to see the report of the findings based on current testing. Enter the scan name to set it for the current gray box scan. Any desired scan name is allowed to be entered. Select the target Android application APK file in this step on which gray box testing is to be performed. The tester will be notified once the target application APK is downloaded successfully. Tester must start VProxy on the target test device and also turn On the listener on MASTS dashboard screen so that the traffic will be captured. As this step is for gray box scan, tester must login in to the application on the target test device and then navigate within the application modules so that the traffic can be captured. Successful captured URL's will be listed in this step. Tester can check/un-check the desired URL's to include/exclude from current gray box scan. This step requires the tester to input valid application login credentials which will be then validated and only upon successful verification tester can proceed. Tester can check/uncheck the test cases which will be applied on the URL's captured in earlier step. Upon completion of the current gray box scan, the tester will be able to see the report of the findings based on current testing. The tester can select any one criteria (at a time) from available options to take the snapshot for the current device. Reverse Engineering - Decompiler facilitates the tester to decompile the target application APK for sourcce code level analysis. TCP Sniffer will capture the traffic flowing from the target application being executed via target test device. Tester has to start the sniffer, execute the target application, browse the modules then stop the sniffer. 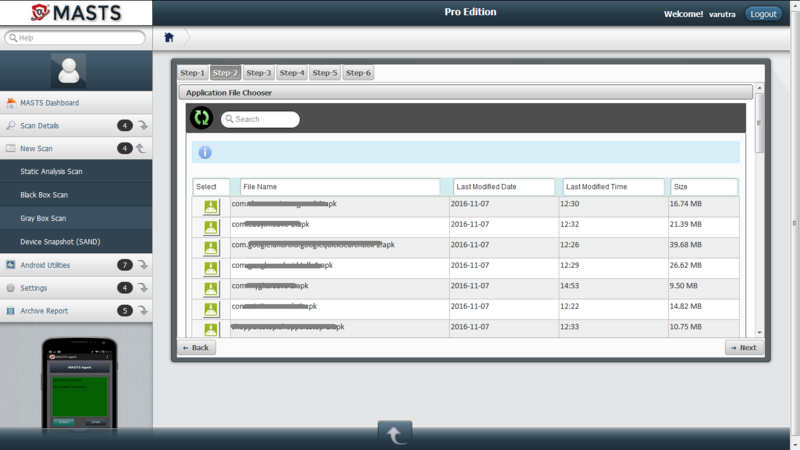 Tester can download the captured file for further analysis. 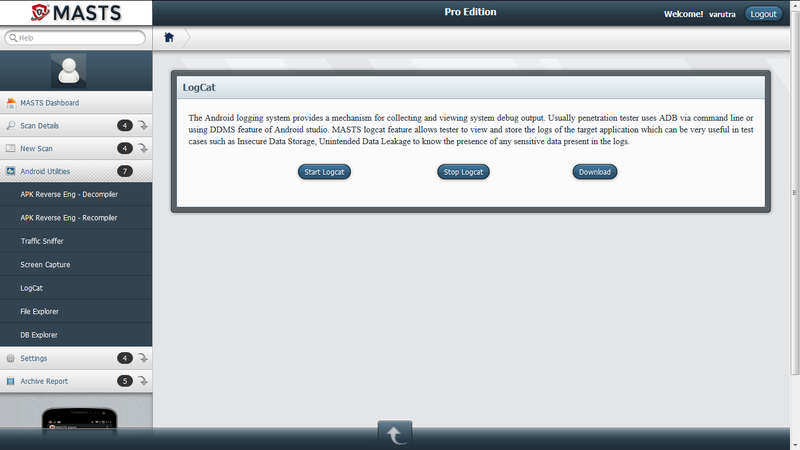 Logcat is log capturing mechanism for Android devices. Logs play a key role in troubleshooting, analysis of application's working, etc. Click on Start Logcat to capture the logs and Stop Logcat to stop the capturing. 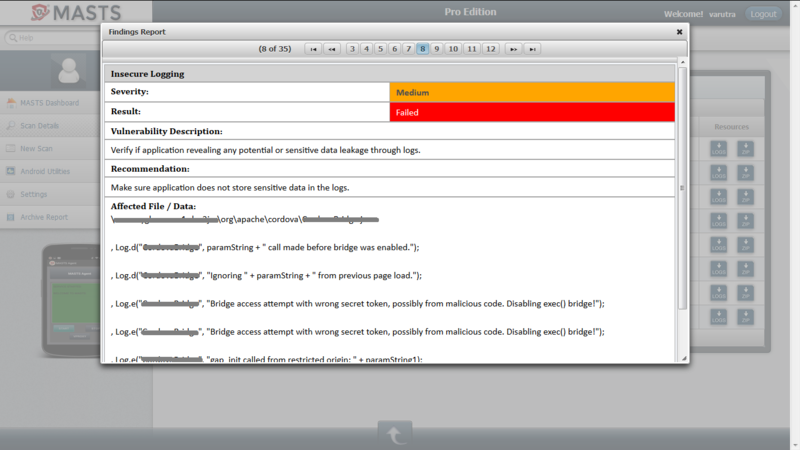 Tester can download logs in plain text files for further analysis during the testing. Welcome to MASTS Knowledge Base section. You will find here the most recently updated articles from MASTS team. 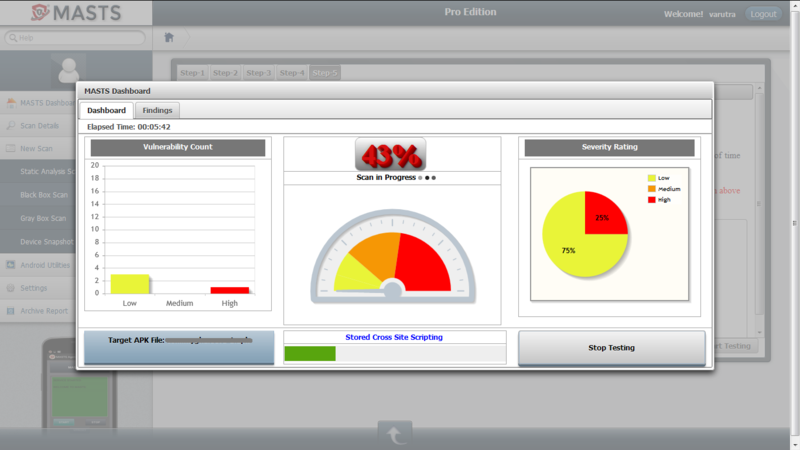 MASTS Trial Edition comes with limited vulnerabilities test cases, features of SAND and few utilities of the product. Trial edition is restricted to 5 scans only. MASTS Professional Edition comes with full vulnerabilities test cases, features of SAND and all utilities of the product. 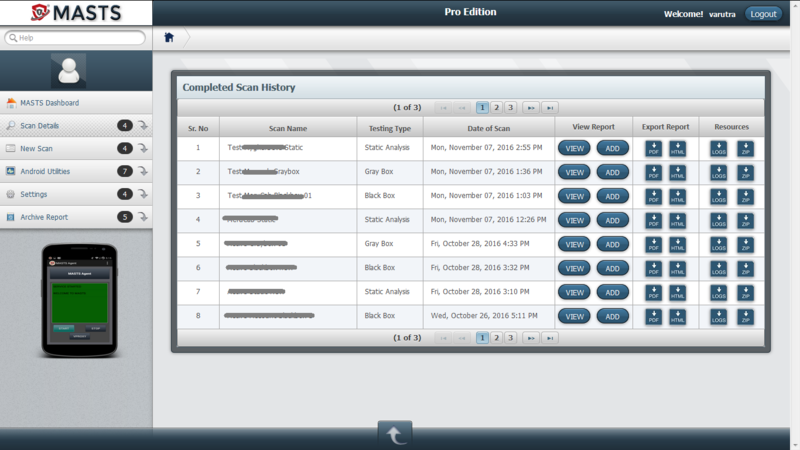 Professional edition offers unlimited scans. To know more about the licensing (per user/per machine/multiple machines) please contact MASTS support. MASTS stands for Mobile Application Security Testing Suite. 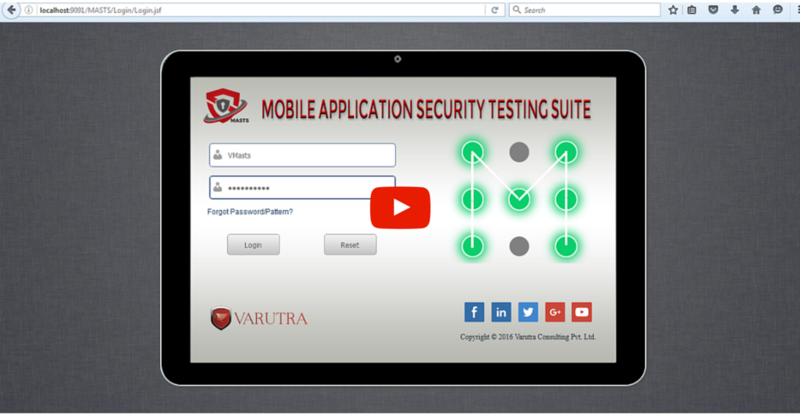 It facilitates users in testing the mobile applications for vulnerabilities by static & dynamic analysis. MASTS adopt same approach of Black Box and Gray Box penetration testing which penetration testers follows. The reports can be generated in PDF and HTML Formats. 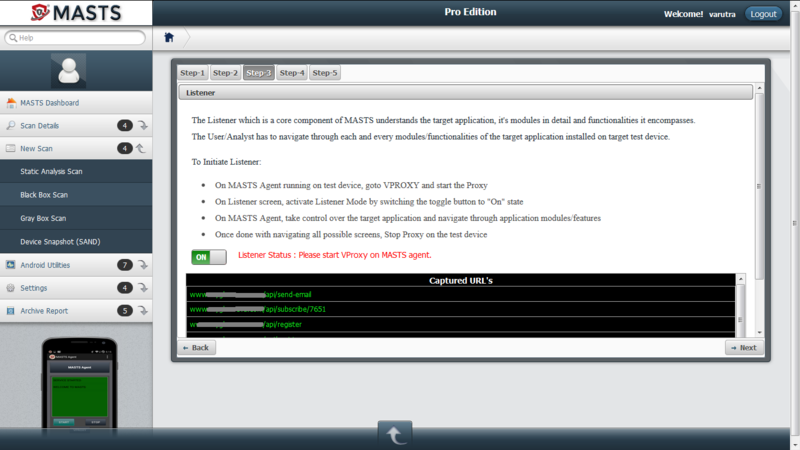 MASTS has a set of built-in utilities such as TCP Traffic Sniffer, Logcat, Device File Explorer, Device DB Explorer, Screen Shooter for capturing PoC and SAND. What is Application Static Analysis? Application Static Analysis is an approach to check the target mobile application and its client side code for any security issues, non compliance to security best practices which may create security vulnerabilities in the application. Black box penetration testing is an approach where penetration tester conducts the security testing of an application as an unknown entity/attacker targeting the application. Pentester do not login into the application and tries to uncover vulnerabilities in it to compromise the application. MASTS allow users to test the target mobile application with black box approach. Gray box penetration testing is an approach where penetration tester conducts the security testing of an application as a malicious application user or the attacker who has authenticated to the application and having bad intentions. MASTS ask testers to login into the target application under testing and then conduct the runtime security testing. How to conduct the testing using MASTS? MASTS conducts the security testing with Black box and Gray box approaches. Check the video on how to conduct security testing using MASTS. Do I need to enter my credentials and security-pattern both while logging in? Yes. MASTS provides secure authentication by implementing 2 factor authentication. How to change my password and security pattern? Only MASTS admin user can change the password and security pattern of other user. In case of issues contact MASTS support team. How MASTS helps me in patching the vulnerabilities it identifies? MASTS provide detailed recommendations for your identified vulnerabilities patching. Based on the support agreements MASTS team can extend their assistance by performing manual assessment and give the recommendations. How can I get new updates of MASTS? MASTS updates are pulled from update server. If the Internet connectivity is present on the machine where MASTS is installed then it will check for new test plugins and update them. How will I know MASTS has updated with specific release? All updates are listed on the website in MASTS TOUR module. MASTS Agent is a developed as a part of MASTS, which gets installed on the mobile device and then authenticates user to conduct the testing as well as aids in entire testing. MASTS Agent connects to the server on default port i.e. 9091. This port can be changes on Server Manager to give custom port. SAND is a short form of Snapshot of ANDroid. Shapshot means taking the state of the device at a specific time which includes every details such as device name, installed applications, hardware details, network details, application’s permissions, application’s files, application databases, etc. Every Snapshot contains details of each and every file present of the device. It does analysis of target application which is under testing by collecting information about the files the target application installs on the device, databases it creates, application permission, Network Information, OS Information, Hardware Information, Installed Browsers, Browser History etc. SAND compares any two snapshots at a given point of time and assists the security tester during the testing as well as forensic activity. I am a Mobile App Pentester. I have modified the APK? Will MASTS test it? Yes. MASTS will run on the modified APK provided it is signed properly. I am not an expert in Pentesting Mobile Apps? How MASTS will help me? MASTS will do revere engineering of your APK automatically. Also it will sign the APK and upload to MASTS testing engine for further analysis and testing. How many types of reports get generated from MASTS? MASTS generate two types of reports. 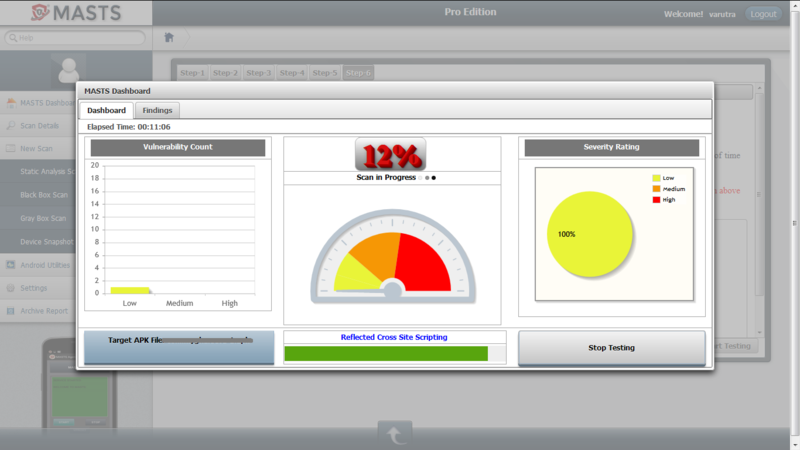 The main report is the security testing report for the target application. SAND utility also generate report for the target device which contains details such as application installed, DB & files the target application creates on the device, application permissions, Network Information, OS Information, Hardware Information, Installed Browsers, Browser History etc. When logged into the MASTS dashboard, in Completed Scan module you can view the report as well as download them in PDF and HTML formats. Can I download customized Reports? As per the licensing MASTS team can help you creating customized reports. Can I add a vulnerability, which I have found manually? Yes. You can add manual findings into MASTS reporting engine and then generate the report for the target application you have tested. Once the new vulnerability has been added MASTS reporting engine will keep it in the database for next time. How can I buy MASTS? You can get MASTS by just clicking on Buy Pro Edition button and fill in the details. For any queries contact MASTS support team. Thank you for your interest in MASTS services. Please provide the following information about your business needs to help us serve you better. This information will enable us to route your request to the respective team. You should receive a response within 48 hours. Thane West, 400605, MH, India. © 2016 Varutra Consulting Pvt. Ltd.